Ready Player One. It’s the movie people can’t stop talking about, one way or another. Half consider it an enjoyable romp worthy of Steven Spielberg, and the other half considers it a hellscape of boredom, maybe even bad intentions. Hyperbole aside, I sat with Will Ashton and Maveryke Hines to discuss the new film, highlighting its strengths, weaknesses, and comparisons to the source material. But that’s not all. For Mini Reviews this week, Will and I finally chatted about Barry, the new show on HBO starring Bill Hader. This pivoted into a discussion about Alex Inc., a somewhat similar new show (circumstantially) starring Zach Braff. From there, we ended up talking about Scrubs for a solid 10 minutes, and you know what? I’m glad we did. The rest of the show contained a bizarre personal story about James Acaster and his new Netflix comedy special Repertoire, followed by a brief review of Best F(r)iends, a new movie starring Greg Sestero and Tommy Wiseau of The Room fame. Question for you: Which Steven Spielberg movie sums up his talent as a filmmaker in your mind? Next Next post: Jon in Theory: What Makes a Movie Character Likable? Spielberg’s best movie is probably Raiders of the Last Ark, BUT Jurassic Park definitely sums up everything I love about him as a director. I don’t get why Jon said this was like the book then spent most of the review saying it’s nothing like the book lol. Great discussion, but i thought that was hilarious. I think I got Jon’s main point though as a book reader myself. The movie follows a lot of the same structure and plot elements, just remixed and stuff. He even said it was like 60% which I think is pretty fair. I liked this one fine. It payed off having low expecations. k so I have always said Scrubs is way closer to what it’s like being a doctor than most shows. That’s not saying much obviously, but it needs to be said. 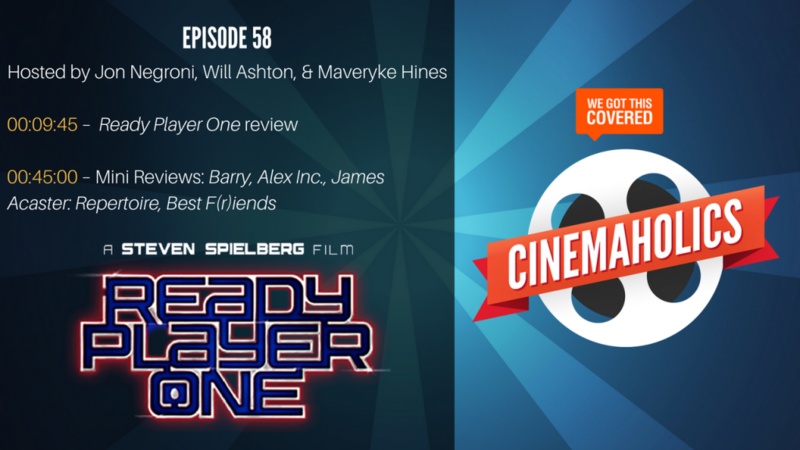 As for Ready Player One, I’m with Maveryke and Will completely, maybe even lower than them. I can’t believe how mediocre this movie was. I was bored the hole time. I didn’t relate to it or like the characters at all. I love love LOVED the book. I wish the movie had done a better job capturing some of the lessons in the book. Just want to take a moment and say I seriously appreciate this review guys. I’ve been listening to nonstop hate mongering over this basic B movie (slashfilmcast especially), and it really is “much ado about very little.” I definitely enjoyed this one closer to Jon, but even in the negative critiques from Will I can tell that they come from a place of genuinely wanting to like the movie.